Looking for fun things to do in Victoria for your child’s birthday party? Tired of having the same boring birthday party for your child year after year and spending hundreds of dollars each time? Look no further than Quest Reality Games for all your birthday party needs! At Quest Reality Games, we will do the birthday party planning for you—the food, the activity, and even the party treat! Children’s birthday parties can be expensive. On average, children’s birthday parties cost between four and five hundred dollars. Between the invitations, the snacks, and the activities, the cost can really add up. 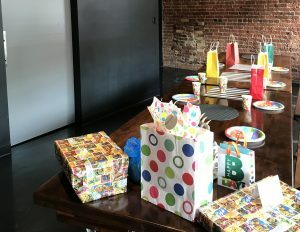 By having a private birthday party at Quest Reality Games everything is already taken care of. All you have to do is show up! Isn’t that a stress reliever? Upon arrival, party guests will be lead to our party room by your dedicated Game Master. There they can play and hang out until their escape game begins. The party guests will then have an hour for their escape game adventure, followed by pizza and treats and more fun in the birthday party room! Our birthday party package includes your choice of an indoor escape room or an outdoor Cluetivity escape game adventure. Also included is a dedicated Game Master, a table in our party room, pizza, juice or water, and a party treat for each guest. Not only that, napkins, plates, and cutlery for the pizza is provided by us! If escape rooms aren’t quite your thing—or if you just need a break—your dedicated Game Masters will join the party guest while they’re in the room to ensure they’re having a great time. Escape rooms are a growing industry. We offer a fun, unique activity for birthday parties that many children will have never experienced before. Escape rooms are also extremely rewarding, and your party guests will be proud of themselves and their friends for the puzzles they accomplish. Your child will certainly be so excited to tell everyone about their birthday party and how they managed to beat an escape room (or almost did)! At Quest Reality Games, we have embraced the evolution of escape rooms by introducing our second-generation, immersive themed escape rooms. If you’re looking for things to do in Victoria that don’t involve the simplistic experience of padlocks, keys and codes, our premium escape game themes offer a gameplay like no other, we test your problem-solving abilities in many ways. If you book a birthday party with Quest Reality Games, you have the choice between one of our four indoor escape rooms. Your guests can outwit the evil sorcerer in the Sorcerer’s Lair, or uncover the truth behind the zombie plague in the Zombie Apocalypse. They can also choose to uncover the secrets of the Rosewood Manor, or try to escape an untimely demise in the Secrets of the Great Pyramid. Or, if your looking for a fun outdoor activity, try one of our three outdoor Cluetivity escape game adventures. You have a choice of travelling through Haunted Victoria, or closing the Magic Portal and stopping the dark forces from taking over the world! Or become an under cover agent and save the world from a deadly mind control virus in Operation Mindfall. Both options will leave the party goers thrilled and wanting more! Our birthday party packages are extremely easy to book! All you have to do is email info@questrealitygames.com or call us directly at 250-800-1008 and your booking process will begin! Once your party is booked all you need to worry about is choosing which toppings you’d like on your Domino’s Pizza. Our Game Masters at Quest Reality Games are also available to answer any birthday related questions during our operating hours. Certainly feel free to give us a call at 250-800-1008 or drop in with any questions. All of our escape rooms are designed to be escaped using teamwork between a small group of close friends. The birthday party guests will have to work together for sixty minutes, while trying to solve several puzzles in order to escape the room. Our escape rooms are designed to be played by groups of up to ten people, keeping the guest list small and more manageable. Want to have a larger party? No problem. Quest Reality Games has four themed escape rooms that can accommodate up to 32 players total! Our Cluetivity games also easily accommodate large groups. Our puzzles test a wide variety of skill sets and interests and are intended for players of all ages and ability levels. For that reason don’t worry about picking your smartest friends—everyone can help! If someone on your guest list is easily frightened, don’t worry, none of our rooms are any scarier than Scooby-Doo! There are no jump scares in any of our rooms. It’s like a Video Game, in real life! Growing up, this game master played a LOT of online escape games. You know the one, where you just click around a bunch and hope you find something? Playing an escape room in real life is a lot like that! Once in the escape room everything becomes a possible clue! Everything in our escape rooms have a purpose—even if that purpose is to distract you! If you’re looking for a more technology-based game, try Cluetivity! To play our Cluetivity, GPS-based augmented reality games, the group will be provided with an iPad and will navigate to several locations in downtown Victoria. 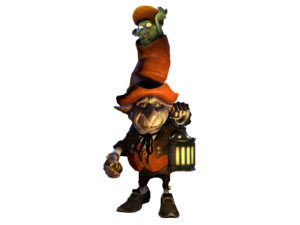 With a little help from your goblin pal you’ll be well on your way to saving the world! If the party attendees were a fan of Pokémon Go, they’ll definitely love Cluetivity! Whether you choose one of our indoor escape game themes, or our Cluetivity outdoor escape games, all of our games are very real, and fully immersive. Escape rooms are good for you! Completing escape room games releases a chemical called dopamine, which leads to a positive mood, sharper concentration, improved memory, and heightened social skills!! So, while your child is playing their escape game they’re actually getting smarter—what could be better than that?! In addition, while you’re in an escape room you’ll be practicing your interpersonal communication skills and developing problem-solving abilities! Escape rooms also help improve your time-management skills and get you into a teamwork-orientated mindset. Who wouldn’t benefit from that? Quest Reality Games is conveniently located in the heart of Victoria’s downtown tourist district, by Bastion Square. It’s also close to many restaurants, pups and parking. Think your party has what it takes to free themselves from the next generation of escape games? If you’re looking for fun things to do in Victoria for your child’s birthday, come down to Quest Reality Games! Where you’ll get to experience a fully immersive, technological escape room! Book now!